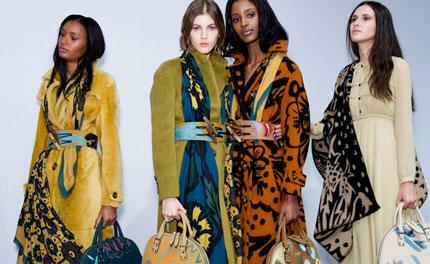 Christopher Bailey may have taken the reigns as Burberry's CEO, but that certainly doesn't mean he's taken his finger off the design pulse. For his Autumn outing, Bailey built upon ideas that tested well at his January menswear show, including the effect of draped silk scarves, oversized hand-painted bags, and a finale salute of chequered equestrian blankets, all re-appropriated with a floating feminine softness. He also brought us back into Bloomsbury territory - last visited during A/W 2009 - although this season he honed in on the infamous set's artwork and the natural beauty of the group's Charleston country meeting place (which Burberry has partnered to restore), rather than specific personalities. Finding his focus in scarf dressing, Bailey unleashed a new passion for belting shawls at the waist, not seen since the Pashmina days. However, his diaphanous dresses weren't the only part of the collection getting the botanical treatment. Trenches were also printed with his scarves' floral watercolours, while his tan shearlings came hand-painted. Clashing motifs at every turn, scarves then became stoles draped modestly over sheer chiffon and micro-fine lace dresses. Acknowledging that the scene was a rather light load for A/W, he then added weight by replacing the fine silk squares with woollen blankets. Checked versions sporting each of his models' initials wrapped up the finale as British songstress Paloma Faith belted out the haunting track Only love can hurt like this.